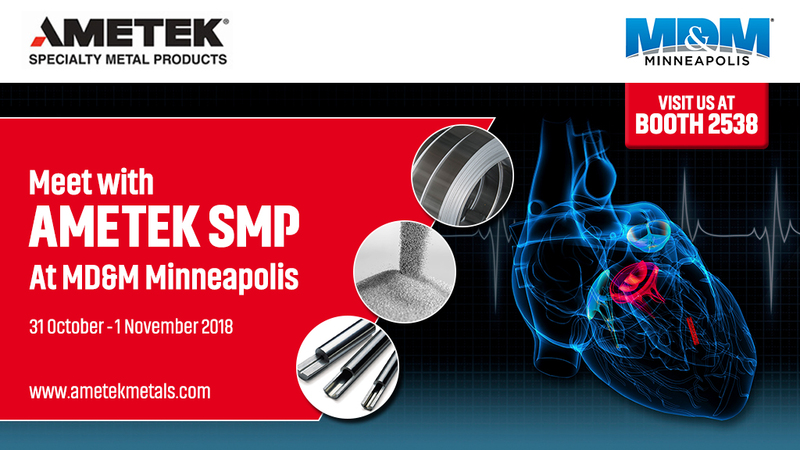 AMETEK Specialty Metal Products (SMP), a leading global manufacturer of precision strip and shaped wire, high-purity metal powders, master alloys and tubes for critical medical applications, will exhibit at Medical Design & Manufacturing (MD&M) Minneapolis from October 31-November 1, 2018. MD&M Minneapolis is the largest medtech event in the US Midwest, offering both a major supplier showcase as well as extensive educational and networking opportunities. Five of AMETEK SMP’s businesses – Hamilton Precision Metals, SMP Wallingford, Reading Alloys, Fine Tubes and Superior Tube – will be demonstrating their expertise in manufacturing advanced metallurgical products in a range of high-quality alloys that offer excellent strength-to-weight ratios, biocompatibility and corrosion resistance. Working with an extensive portfolio of high-performance alloys, Hamilton Precision Metals produces precision strip and foil for implantable devices. Titanium strip products for implantable enclosures are produced with fine grain size for drawability, superior surface finish, and short lead-times. Titanium can also be reduced to thin gauges (to 7.5 micron), low roughness (<2 µinch Ra) or high roughness (>25 µinch Ra) for electrode, cathode and antenna applications. Hamilton works in many other medical alloys including MP35N® for stents and spring connectors, Stainless steels for surgical instruments and battery enclosures, and resistance alloys for medical diagnostics. SMP Wallingford specializes in high purity Nickel Strip for electronics and battery connectors in critical medical and defense applications. Specialty Shaped Wire is also produced for use in orthodontic brackets, toothbrush staple wires, and channel wire for superconductors in MRI machines. With a total of six manufacturing locations and a network of global sales offices, AMETEK SMP has the ability to develop custom metallurgical solutions for medical applications in which reliability and quality are paramount.